"Wonderful decorative quality, early 1920s Gray's Pottery Art Deco bone china porcelain cup and saucer. Clearly a pattern in the Susie Cooper style - most probably an early design by her. A rare example and highly collectable on the comparatively rare Duchess China body." Antiques Expert Hamilton Bear. Dimensions: height cup 750 mm max. width saucer 132 mm max. Marks: to base including pattern number to saucer illustrated. 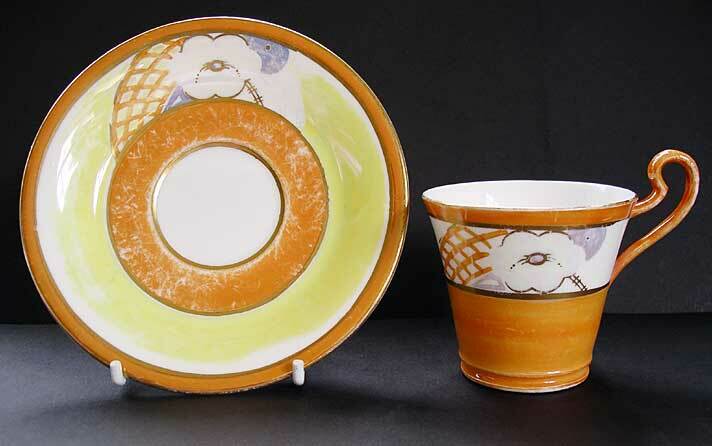 References: Pattern 7110 appears unrecorded in any available literature on Gray's Pottery. 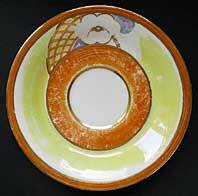 The style is consistent with Gloria Lustre wares and Susie Cooper designs for Gray's. Most probably this is an unrecorded Susie Cooper design and dates from c.1926-27 - her most influential period at Gray's Pottery. 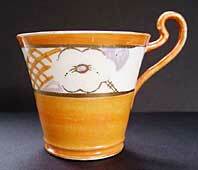 The unusual cup shape may also be a Susie Cooper design and is worthy of further research. Bone china or porcelain is quite unusual for Grays Pottery: most hand painted designs were produced on in the white earthenware blanks. This pre-decorated cup and saucer china was made by Edwards and Brown, Victoria Works Longton and is their Duchess China body. Printed under-stamp in green; Godden 1458 with "Made in England" added; is still discernible, with effort, on both pieces. E & B L ceased production in 1933. Condition: Overall, colourful and bright with no chips or staining. Good condition for display with typical light rubbing wear to rims and the easily worn, impractical, lustre decoration. There are two fine faint hairlines to the cup which do not detract significantly from the general decorative appeal of this rare and fragile item.